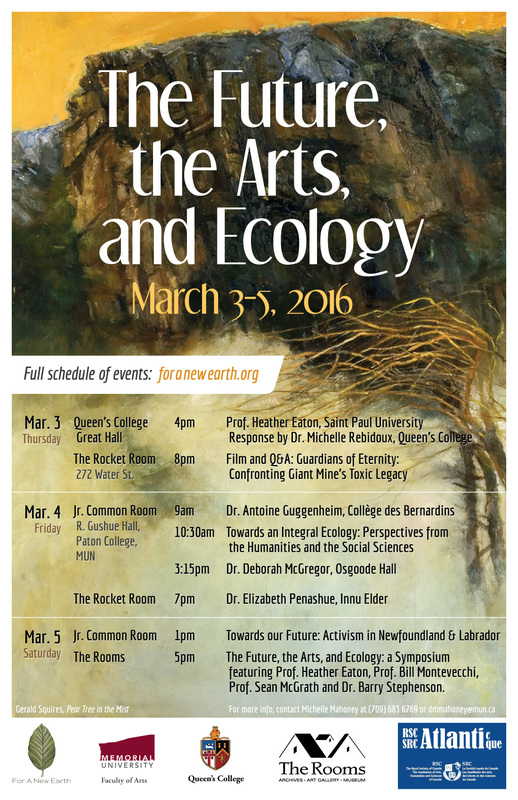 The Faculty of Arts at Memorial University, in collaboration with Queen’s College, the Royal Society of Canada, and The Rooms, is hosting three days of talks, films, performances, and art exhibits on the theme of interdisciplinary ecology from the 3rd to the 5th of March 2016. Keynote speakers include Professor Heather Eaton (Saint Paul University), Dr. Deborah McGregor (Osgoode Hall), Dr. Antoine Guggenheim (Collège des Bernardins, Paris), Dr. Elizabeth Penashue (Innu Elder), and Professor Bill Montevecchi (Memorial). Events begin at 4pm Thursday March 3rd at Queen’s College, 210 Prince Philip Drive, St. John’s, and conclude with an evening at The Rooms beginning at 5pm Saturday March 5th. This entry was posted in arts, events. Bookmark the permalink.